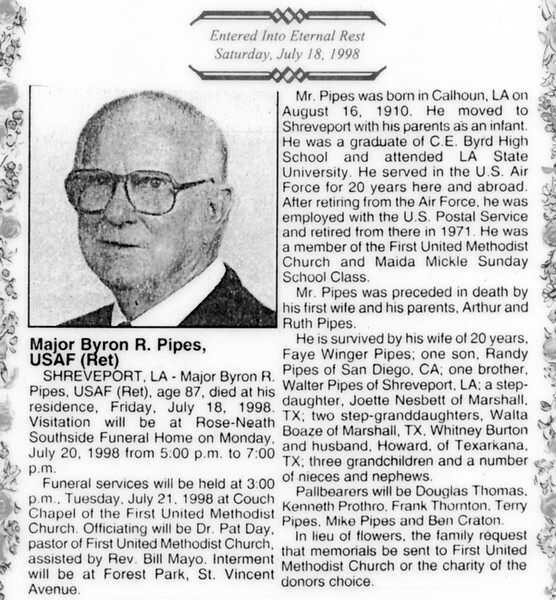 [RP] After Dad retired from the US Postal Service in 1971, and while I was going to LSU in Baton Rouge, he began attending classes at LSU Shreveport. It was also in that year that he finished compiling the photo books and notes that were a large part of this collection. Dad hated the post office, and of course we were all still affected by Mom's passing. But he reveled in his new life, and he became a new man. He loved learning, and going to LSU at this time, he was like a kid in a candy shop. One weekend when I came home from school he had a party at the house with some of his new young friends from LSU. It was pretty strange to me, but he was obviously loved by his classmates, if partially because of his novelty. Regardless, I was very happy to see that he was enjoying life again. This clipping was written by one of his professors who was clearly impressed by Dad's passion for learning. He calls Dad a "scholar and a gentleman", an acclaim that was appreciated and deserved. [RP] Even though Dad was 87, he died only shortly after his cancer was discovered and after exploratory surgery was performed. It was very though - I only was able to exchange a few words with him since he was semi-conscious much of the time. Thank goodness for Faye, who really helped us through it. I will always miss my my Dad, and happy that I am very much like him.